The beautiful Tiger, such a majestic animal, may not be available for our next generation to see. In India, there are only 1411 tigers left and has become an endangered species. Tiger is our national animal. Shame on us for calling it so. It has been poached, hunted since history. India is home to the world’s largest population of tigers in the wild. According to the World Wildlife Fund, of the 3,500 tigers around the world, 1,400 are found in India. A major concerted conservation effort, known as Project Tiger, has been underway since 1973, which was initially spearheaded by Indira Gandhi. The fundamental accomplishment has been the establishment of over 25 well-monitored tiger reserves in reclaimed land where human development is categorically forbidden. The program has been credited with tripling the number of wild Bengal tigers from roughly 1,200 in 1973 to over 3,500 in the 1990s. However, a tiger census carried out in 2007, whose report was published on February 12, 2008, stated that the wild tiger population in India declined by 60% to a shocking 1,411. It is noted in the report that the decrease of tiger population can be attributed directly to poaching. both of which are manmade. Tigers are solitary animals and their natural habitats are being invaded by humans and as a result, they enter the human grounds for prey. Tigers are not normally man-eaters, but due to depleting habitat and its usual preferred prey like deer, sambar etc., it has to hunt humans, which are easy prey. The rapid disappearance of the wild tiger in India was, until recently, attributed almost exclusively to habitat loss. According to a report I read on the web, it has now become clear that the tiger faces an even greater threat from poachers. The outside demand for tiger bones and parts for use in oriental medicine has brought the tiger to the brink of extinction. In India it is estimated that the tiger is being poached at the rate of 1 per day. At this rate the wild tiger in India will suffer the same fate as its cousins in the Far East and will disappear within the next 5 to 10 years unless serious measures are taken to protect it. Poaching in India is organized and widespread and faces little opposition from ill equipped, unarmed and too few wardens and park rangers. A single warden can be responsible for patrolling up to 20 square kilometers a daunting task considering many of them don’t have any shoes to wear let alone binoculars, vehicles or guns. Although India has enacted legislation to protect the tiger and created many tiger reserves, enforcement has been difficult, if not impossible, with the current means available. Wardens often risk their lives to enforce the law only to be frustrated in their efforts and to find themselves reassigned to other areas. Investigators are hampered by lack of funding and poor support. In 1994 trade in tiger parts was banned in China, Taiwan, Hong Kong, South Korea and much of South East Asia, but the clandestine trade continues to flourish. The trade is still legal in Japan and North Korea. Although it is banned in North America the illegal trade of tiger parts and imported medicines containing tiger parts and bone continues in both Canada and the United States. 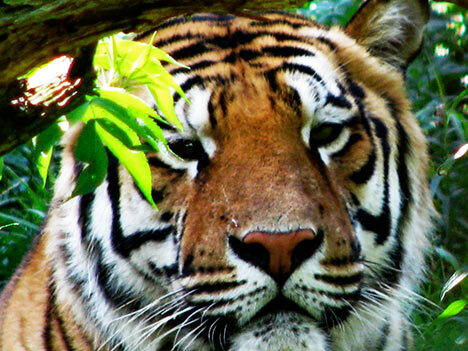 What can you do to save tigers? Roar Online: From Facebook to YouTube, from Twitter to blogs, make the roar loud and clear. Spread the message and share your concern. I have done this bit now. Be informed: Know your tigers… awareness goes a long way. Be a responsible tourist: Visit tiger sanctuaries and national parks and discover our country’s natural heritage. But please remember that the wilderness is to be experienced, not to be polluted by packets of chips, plastic, non-biodegradable waste or garbage etc. Preserve our natural resources: Loss of habitat is one of our tigers’ biggest problems. We can reduce pressure on forests by avoiding unnecessary use of forest-derived products, such as paper and timber. Volunteer: If you can, contact an NGO working for tiger conservation to volunteer for our tigers. Previous postEarthlings – Must…Must…Must watch documentary! !